What makes CAT one of the most formidable competitive exams is the high-pressure exam pattern more than the complexity of the syllabus. It is, therefore, imperative to be well-versed with the examination pattern to brace yourself for what’s in store for you on the D-day. The CAT now follows a computer-based exam pattern, where 100 MCQs carrying a total of 300 marks need to be finished in a three-hour timeline. The online version of the exam complicates matters further, as unlike the previously followed pen-and-paper pattern where candidates had the option to go back-and-forth between sections, the exam now comes with a sectional time limit and candidates cannot choose which section to attempt first. The different sections of the exam will appear in the following order – Verbal Ability and Reading Comprehension, Data Interpretation and Logical Reasoning and Quantitative Ability. This makes it all the more crucial for you to be thorough with all the three sections, as there is little scope to revisit a section or question at a later stage. The aim should be to get as many answers correct as possible in the first go and skip the rest without letting it dent your confidence. You must approach your study plan with that objective in mind, especially during these final months. This section often proves to be the trickiest in CAT. Candidates who have a good command over the English language often overlook this section during their preparation days in favor the seemingly more difficult ones like quant and data interpretation. On the other hand, those who already struggle with English find the vast subject too intimidating and prefer to make up for it by preparing the other two sections. Either way, ignoring the Verbal Ability and Reading Comprehension can prove to be detrimental to your success for multiple reasons. First of all, you have to meet the sectional cut offs to qualify the exam. Second, the intricacies of the English language can get too confusing in that high-pressure environment if you are not well prepared. Finally, since it is the first section of the exam, it sets the tone for your overall performance. Read Extensively: Reading is one of the best ways to improve your grasp over the English language. Since it is an acquired language for us, there no better way to understand its nuances than reading. You can study all the grammar rules but you won’t know how to apply them the right way unless you can place them in a context, and reading gives you that context. Besides improving your language skills and vocabulary, it also boosts your comprehension abilities, which account for a major chunk of marks in this section. Improve Your Vocabulary: Vocabulary also plays a significant role in the Verbal Ability section of CAT. Given the difficulty level of the exam, you can expect that the vocabulary-based questions will not be based on words used in everyday conversations. The best way to build up your vocabulary is to pick up at least five words a day from books like Barron’s or Word Power and use them in your writing and conversation as much as possible until they are embedded in your memory. Brush Up Your Grammar Basics: The grammar portion of this section may seem too simple at the outset, as it comprises the same grammar rules you have been studying since school. However, unless you are literature student or graduate, there is good chance that these rules are buried in some abyss of your brain. It is a good idea to revisit these grammar basics regularly so that you have clarity about all the rules, exceptions and so on. Being Familiar with the Caselets: The questions in this section are formulated in form of caselets, which means you will be presented with a case followed by three to four related questions. For the data interpretation portion, these caselets will be forms of graphs and pie charts, where as for logical reasoning, the focus will be on arrangements, Venn diagrams etc. You focus should on familiarizing yourself with these versatile data representation forms. Some of these questions also require algorithmic calculations, which can be time-consuming if you are not well-versed with the shortcuts and trick to solve them, and that’s what you must aim to master in this final run up to the CAT preparation. Work on Your Calculation Speed: The data interpretation questions in CAT are notorious for being calculation intensive. To be able to solve these problems correctly and without losing too much time, you need to work on improving your calculation speed. Also, learning to make the optimum uses of screen calculator can be a big asset on exam day. Practice: The best way to put your learning to test and improve your performance in this section is to practice every day. In these final months, you must aim to solve at least one practice test for the data interpretation and logical reasoning section to hone your ability to apply concepts for problem solving. Solving puzzles and playing mental games such as crosswords, riddles and Sudoku can give you an eye for trick questions. Brush Up on Your Basics: Even if you have been preparing for months now, it is a good idea to keep brushing up your basics every now and then during these last few days, so that the formulae, equations, rules and tips and tricks remain fresh in your mind. Focus on the Important Topics: If you find yourself struggling with quant, the smart approach is to analyse the topics that carry the most weightage in the exam and just focus on perfecting those in this final phase of your preparation. Aiming to get all the questions right can be a tad unrealistic. Therefore, your aim should be to master at least four or five topics that see most representation in the exam, so that you can safely pass the sectional cut-off. Write and Learn the Formulae: The tricky thing about mathematics is that there are hundreds of formulae to memorise and each one of these can be applied in a hundred different ways. Dedicate some time daily to just learn these formulae and equations by writing them down. Then attempt questions based on these so that you are thorough with their usage in different problems. 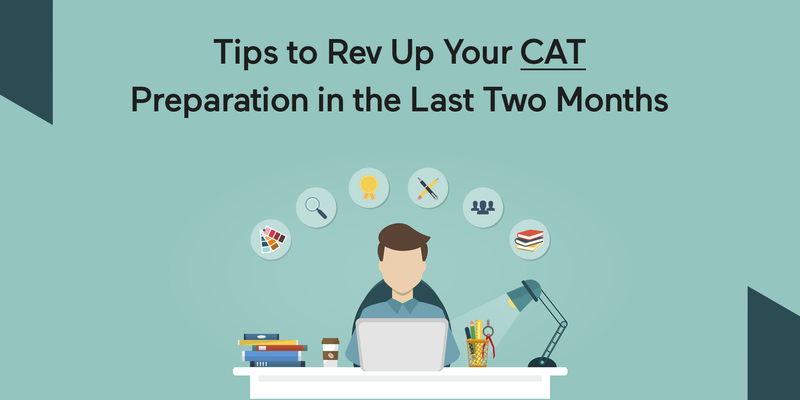 Practice remains the key to success in CAT. You must attempt at least one mock test every alternate day and then spend some time analyzing your hits and misses to be fully prepared to take on the CAT.